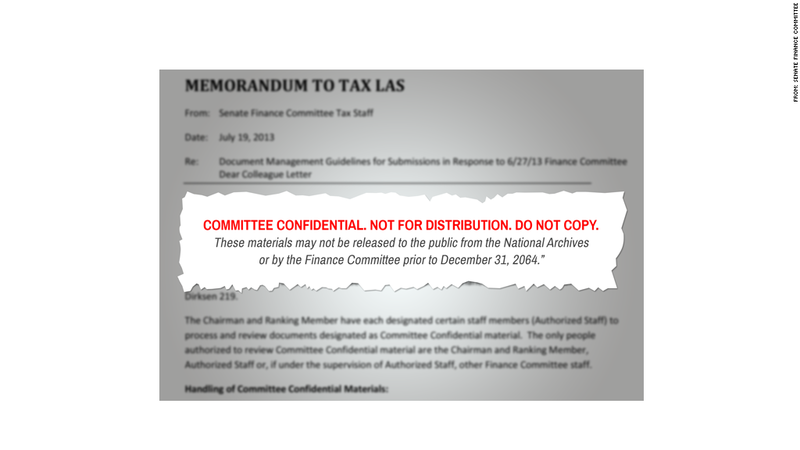 The Senate Finance Committee has promised senators that their tax break proposals will be kept secret until 2064. Tax reform is apparently so treacherous for senators these days that they require the utmost protection from the public -- half a century's worth. The leaders of the Senate Finance Committee last month asked senators to submit written proposals detailing tax breaks they'd like to see preserved once the tax code is reformed and explain why. The point was to help inform committee leaders in their efforts to craft a tax reform bill. The request apparently wasn't embraced, and the committee has now promised skittish senators that their proposals will be kept secret for 50 years. A memo sent out on July 19 promised to mark all submissions "COMMITTEE CONFIDENTIAL. NOT FOR DISTRIBUTION. DO NOT COPY. These materials may not be released to the public from the National Archives or by the Finance Committee prior to December 31, 2064." What's more, the memo said that in addition to the committee's chairman and top Republican, only 10 staffers would be authorized to see the proposals. Only two digital copies of them would be made. Each would be saved on a secure, password-protected server. Paper copies would be kept in locked safes. The only way a proposal could be made public before Dec. 31, 2064, is if it "has been modified in such a manner that it could not potentially identify the source of a submission." It's not clear who made the decision to offer the "committee confidential" designation, but a committee aide said it was "done to alleviate the concerns of senators." The same aide said "the 50-year rule is the practice for all congressional committees and generally covers oversight and investigative materials and related work product, as well as all nomination materials." That's news to congressional scholar Thomas Mann, who said he's never heard of the practice and said it sounds "gimmicky." "It's one thing if they wanted to have some closed hearings for a general discussion before proceeding to an open mark-up. That would be constructive," Mann said. But by treating the proposals as confidential it means a senator can argue for a tax break on paper but then attack it publicly if that suits his political interests. And Mann doesn't see how that pushes the debate forward because at some point senators will have to stand up and be counted. "Plenty of things are classified. But this is different. This is a normal public policy thing," Mann said. "If something then gets included in a package, the member is either going to be for it or against it." So, how many written proposals has the Finance Committee received so far? No one's saying.